The EU is one of the most successful peace projects in history, but we are in a time of real danger for the peaceful and humanitarian values that have been institutionalised over the last 70 years. The response to the migration crisis is the biggest human rights issue in Europe at present, yet European nations and governments are failing to meet the very standards they helped create. If there was ever a time for Quakers to bring our voice and our expertise to discussions about fundamental rights and justice, it is now. Over the recent years, fleeing poverty, violence, persecution and war, the number of refugees and migrants trying to reach European shores has increased substantially. This is due in large part to the war in Syria and Iraq, as well as to other violent conflict, oppression and poverty in countries such as Afghanistan, Eritrea and elsewhere. Against the backdrop of a slow economic recovery, increasing nationalism and fear of violent extremism, the European response to migration has been one that has portrayed migration as a security issue (securitisation of migration). Migration is thus framed as a threat that needs to be dealt with urgently. Such an approach helps justify the use of exceptional measures, beyond those that might ordinarily be politically acceptable. All of this is taking place in the context of an increase in the number of children seeking asylum in Europe in the last two years. 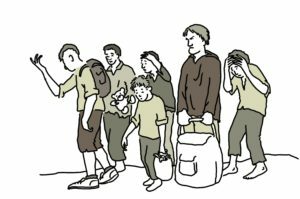 In 2016, children made up 32 percent of the total number of first time asylum applicants in European Union countries. On the dangerous Central Mediterranean Sea passage from North Africa to Europe, In Italy, 92 percent of children who arrived in 2016 and the first two months of 2017 were unaccompanied, up from 75 percent in 2015. As a consquence, the number of refugee and migrant children being detained in European countries has also risen significantly. In response, QCEA's Human Rights Programme was launched in 2017 with an initial focus on the issue of child migration detention. There is only a limited amount of advocacy being undertaken on this matter, and very limited research, both of which are competing for attention with the vast range of migration related issues dominating the European landscape. As a Quaker organisation we can draw upon a long history of working on detention and detention conditions to help shed a light on a massively under-reported phenomenon. As such, the initial phases of our Human Rights Programme will concentrate on researching the state of child migration detention in Europe, complementing and building on the initial enquiries undertaken by the European Union Fundamental Rights Agency. QCEA’s standing on these issues stems from our Quaker constituency and our own work. One of the founding principles of the Religious Society of Friends (Quakers) was the recognition that every person is unique and their life must be valued.